I know you're supposed to grill burgers. But for chicken burgers - even when the ground chicken mixture includes plenty of dark meat - I find the grill too aggressive. There's nothing worse than a dry chicken burger. And that's what I get when I cook chicken burgers on the grill. My favorite chicken burger is moist, well seasoned, studded with chopped green onions, and cooked in a skillet on the stove. Three ingredients, not counting the bun, the garnish, and the sauce. You'll have dinner on the table in less than half an hour. 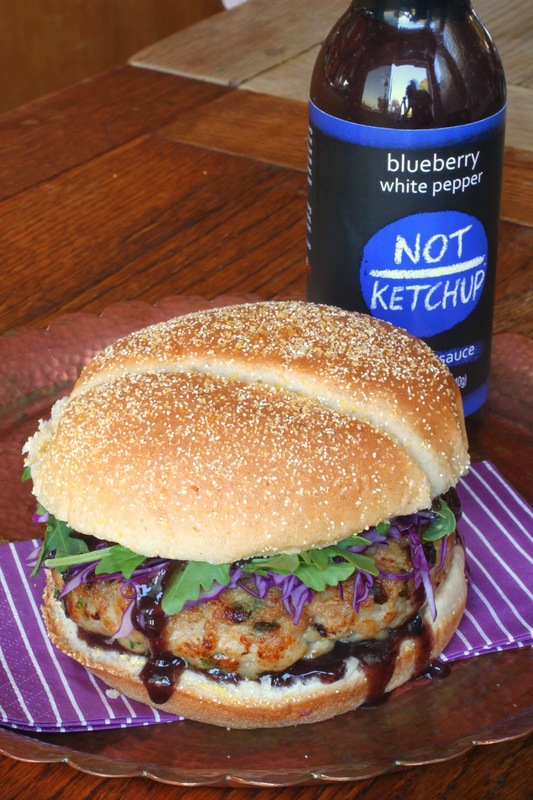 About the sauce: My favorite for chicken burgers is Blueberry White Pepper Not Ketchup. The combination of sweet, tangy, peppery and savory brings a lot of zest to the delicate chicken. In fact, when I was first working on the recipes for my Not Ketchup sauces, I tested the blueberry prototype on chicken breasts, chicken thighs, chicken tenders, and roast chicken. Blueberries and chicken...who knew? A moist chicken burger that's well seasoned, studded with green onions, and served with Blueberry White Pepper Not Ketchup. In a large bowl, mix the ground chicken, green onions, and garlic salt with your hands until well combined. Divide the chicken mixture into four equal parts, then shape into four patties.Heat a large nonstick skillet over medium heat. Add the olive oil, then place the chicken burgers in the pan. Cook about 10 minutes on the first side, then flip and cook until the burgers are cooked all the way through, about 8 minutes more. Put the burgers on a plate, cover with foil, and let rest 5 minutes.To serve, spread some Blueberry White Pepper Not Ketchup on the bottom half of each bun and place a chicken burger on it. Drizzle with more Not Ketchup, add a handful of lettuce or arugula to each burger, and place the other half of each bun on top. Serve immediately.